U.K.The steelworks in Duisburg employed 3,000 people when it was closed in 1985. Today, the disused factory, now a park showcasing the city's industrial heritage, gives work to dozens of curators, artists and athletes. U.K.The mood among German investors improved more than expected in September as worries about the stronger euro EUR= faded, suggesting that markets expect Europe's biggest economy to continue its solid performance in coming months. U.K.Germany's centre-left Social Democrats (SPD) slightly narrowed their gap with Chancellor Angela Merkel's conservatives in a poll published on Tuesday five days before a federal election. Are German voters concerned about the future of Europe? 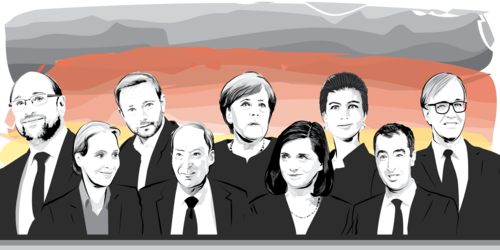 If Merkel wins the election, will her coalition choices affect her EU negotiation options? Reuters' Paul Carrel and Noah Barkin discuss the impact of Europe on the German election. U.K.The far right is making the most noise on Twitter during Germany's election campaign, but far less fake news is being spread in Germany than the United States saw before the election that put Donald Trump in power, an Oxford University study has found. U.K.German Chancellor Angela Merkel is on track to win a fourth term in Sunday's national election despite a dip in support for her conservatives, a poll showed on Tuesday, and she shrugged off calls to quit from far-right hecklers. U.K.Fears in Germany that voter apathy could boost the far-right Alternative for Germany (AfD) in Sunday's election have driven Chancellor Angela Merkel and her main rival in final days of the campaign to urge their backers to go out and vote. Thomas Escritt here in Berlin, where we are in the final stretch before Germany votes in parliamentary elections on Sunday. To get you started, here are profiles of the parties, their leaders and their standing in the polls. With Chancellor Angela Merkel's Christian Democrats far ahead in the polls, most expect the excitement to be about coalition options after the elections. Will Merkel continue to rule in a left-right coalition with the Social Democrats, now led by Martin Schulz? Will the conservatives resume their traditional alliance with the pro-business Free Democratic Party? And will the anti-immigrant Alternative for Germany (AfD) party clear the 5 percent threshold, becoming the first far-right party in decades to take seats in the German parliament? Our colleague Madeline Chambers has been looking at Merkel's attempts to get her supporters out to vote: under Germany's proportional electoral system, low turn-out could help the AfD, giving them more seats from the same number of votes. Our European affairs editor Noah Barkin and Berlin Chief Correspondent Paul Carrel have done a podcast previewing what to expect on Sunday. While there, you could listen to me and Michelle Martin discussing the role Germany's large Turkish diaspora could play in the coming vote. U.K.At first glance, Germany's federal election looks like a done deal -- all major polls predict Chancellor Angela Merkel's conservatives to come in first, a result that should mean no political upheaval in Europe's biggest economy. 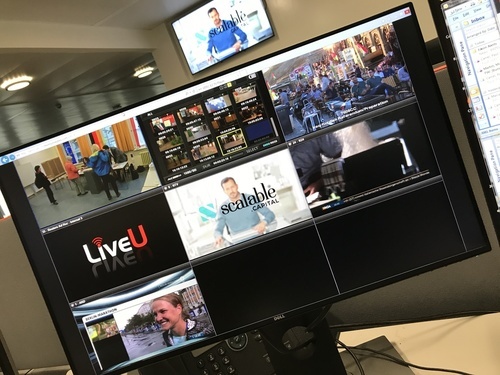 U.K.Barring an upset, the main uncertainty surrounding Europe's most important election this year is not whether Angela Merkel will continue to lead Germany after this weekend's vote, but who with and how long they will take to get going. 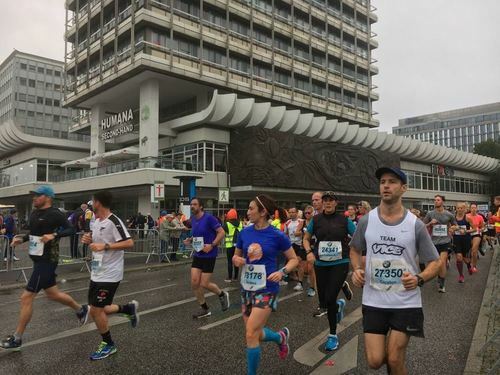 Good morning from a rainy Berlin, where the video feeds suggest it's a toss-up between the Berlin Marathon and the parliamentary elections for biggest story of the day. While almost everyone expects conservative Angela Merkel to come out ahead in today's elections, winning a fourth term as chancellor, it's an election of real consequence, with many looking to her as a defender of the western liberal order after the democratic upsets of 2016, as Berlin chief correspondent Paul Carrel and I explain here. "The ability to vote and live in a democratic country is a dream of many in this world. Go vote and protect your democracy, protect us from people who divide us into categories, fight against our ability to live together and want to divide the society." Take a look at the candidates and issues with our interactive graphic. 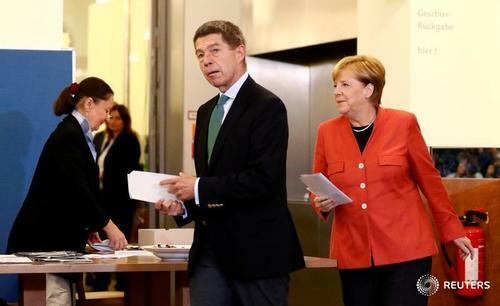 U.S.Germans were urged to vote in a national election on Sunday in which a seemingly assured fourth term for Chancellor Angela Merkel risks being overshadowed by a far-right party entering parliament in more than half a century. The marathon is over, with Kenya's Eliud Kipchoge the winner, followed by newcomer Guye Adola of Ethiopia in what is quite an upset. Now it's up to the elections story to pick up the pace. More than ever, the German elections are a European and an international affair. Here's the UETD, a Turkish diaspora organisation in Europe with close links to Turkish President Recep Tayyip Erdogan's AKP party, urging people to vote, in German and Turkish. No party endorsement, though. Erdogan made waves before the elections by telling Germans of Turkish background not to vote for Angela Merkel's conservatives, Martin Schulz's Social Democrats, or the Greens, led by Cem Ozdemir, himself Turkey's most prominent politicians of Turkish background. He branded all three parties "unfriendly" to Turkey, and his intervention stirred angry accusations of interference from Germany. I wrote more about the role of Turkey and Germany's Turks in the elections here, and you can hear me discussing it with Michelle Martin in this podcast. 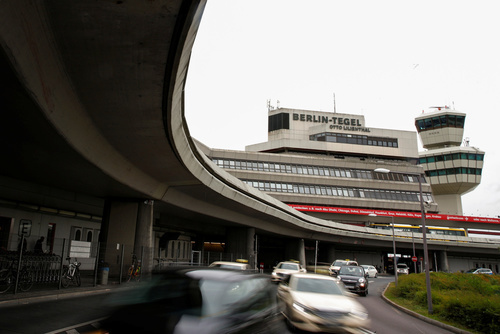 For some living under its flight path, today's local referendum on whether to keep open or shutter Berlin's Tegel airport may impinge on their daily lives more than parliamentary elections. The terminal, much loved by business travellers because of its proximity to the city centre and the speed at which they can get from plane to taxi, is due to shut when the new, and much-delayed Berlin Brandenburg airport opens. But with Brandenburg airport set to be overcrowded the day it opens, many want the venerable airport, which dates back to the 1948 Berlin airlift, to be spared. U.K.Turnout slipped slightly in Germany's election despite politicians warning that apathy could boost the far-right, expected to return to parliament after a half century's absence, overshadowing Chancellor Angela Merkel's expected victory. The election authority, the Federal Returning Officer, has published data showing turnout slipping slightly at 1400 German time (1200 GMT). 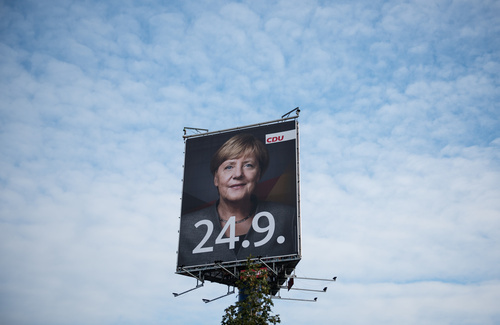 While it's only slightly lower than in 2013 - 41.1 percent compared to 41.4 percent four years ago - that will come as a disappointment to all the senior politicians who have urged Germans to turn out en masse to avoid giving the far-right a boost. Merkel's most famous phrase, when hundreds of thousands of refugees were streaming into Germany in 2015, was "Wir schaffen das" - "We can manage this". 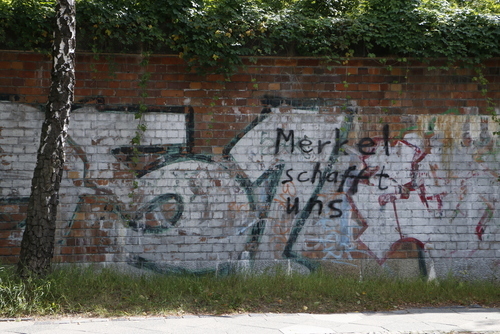 Out by the lakes along Berlin's western border, our colleague Andrea Shalal spotted this graffiti today. "Merkel schafft uns" - "Merkel will do us in". A snapshot of some the sentiments driving the anti-immigrant Alternative for Germany up in the polls. If the hard-right Alternative for Germany (AfD) party does get into parliament, corks will fly at its Berlin victory party. Michelle Martin, who's been covering the AfD for longer than just about anyone else, is there. 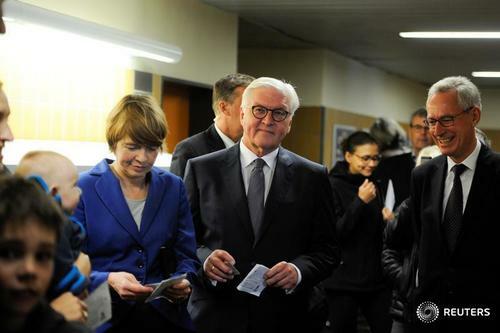 U.S.Turnout in Germany's national election was slightly lower at 1200 GMT than at the same time four years ago, the Federal Returning Officer said in a statement on Sunday.